Chatauqua Peak is one of the most popular locations to visit in the Grampians, due to its beautiful panoramic views and its close proximity to Halls Gap. 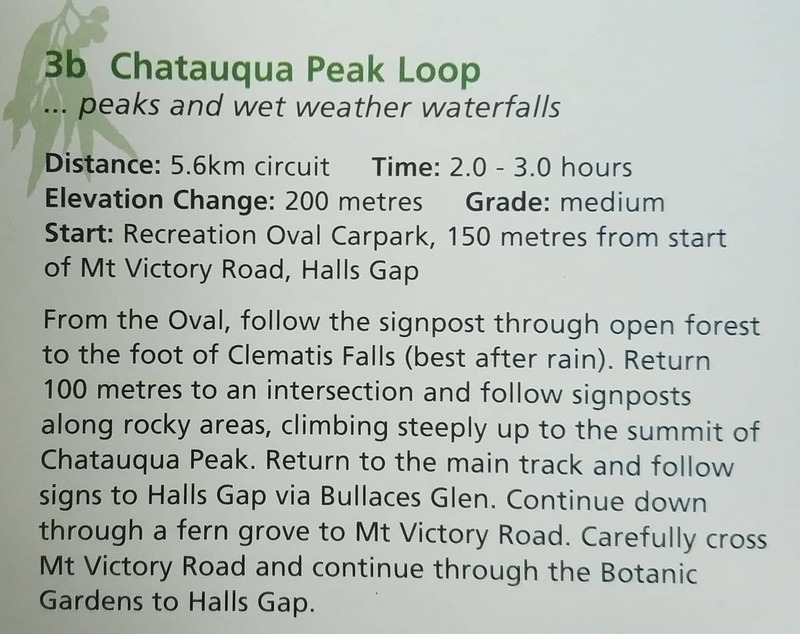 Chatauqua Peak is located in the Grampians National Park with the loop walk commencing at the Halls Gap Botanic Gardens, with access through the Caravan Park. The walking track is a 5.6km circuit loop which takes most hikers between 2-3 hours to complete. At 200 metres elevation, the track is very steep and is considered a moderate difficulty. As you get closer to the summit, some basic climbing over rocks will be required, therefore it is not suitable for those with mobility issues or for young children. Once at the peak, you will be rewarded with stunning views of the Grampians National Park and Mount Gar Ranges. Make your way back down the way you came. There are signposts along the way, but hikers should make sure to get a detailed map before setting out on any hikes in the Grampians. This walk will take you past Clematis Falls which is best viewed in the rainy season between May – August. You do not need a permit or make a booking to do this hike, but please note that no dogs or other animals are permitted in the Grampians National Park. Make sure to wear appropriate footwear and carry plenty of water and warm clothing during the winter months.